3D rendering of the Martian structures. Image Credit Mundo Desconocido. 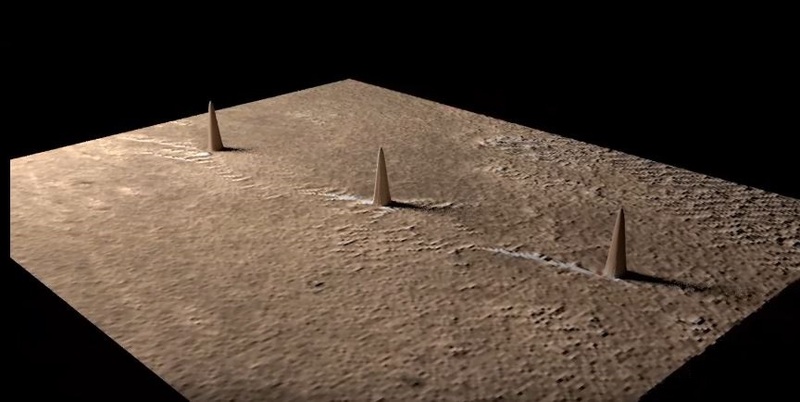 Located in the area of Terra Meridiani, researchers have spotted three massive ‘Towers’ on the Martian Surface that are so perfectly aligned, that just as the Pyramids of Giza on Earth, these Martian towers seem to mimic the constellation of Orion. Ufo hunters have come across yet another bizarre discovery on the surface of the red planet. 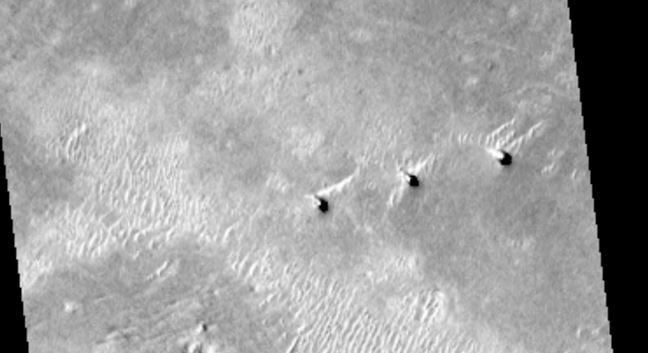 This time, UFOlogists have spotted three odd, perfectly aligned ‘towers’ on the Martian surface. Some have even noticed that they eerily resemble the position of the Pyramid of Giza and how they too mimic the three main stars of the constellation of Orion. Yes, the red planet is full of surprises that most of us cannot understand. While there are countless things found on the surface of Mars that resemble objects, structures, and even monuments, in the end, they are nothing more than pareidolia kicking in. However, there are quite a few peculiar findings that cannot be explained as pareidolia. Such discovery may be the three recently found towers on the surface of Mars. Featured in a YouTube video uploaded by mundodesconocido, the footage details three perfectly aligned towers on the surface of the red planet. The video footage explains where the towers were found and what they could possibly be. Speaking in the video, channel curator Jose Luis said: “Investigating on some Mars images, we have recently found a row of huge towers located in the Martian area of Terra Meridiani. “Due to their peculiar features, we believe that they have an artificial origin. Apparently, these structures even mimic the constellation of Orion. Interestingly, the specific image which clearly shows three ‘objects’ protruding from the Martian surface was captured in 1999, and since then these alleged structures could have been heavily modified by Mars hostile weather conditions. The so-called towers are located in the Terra Meridiani region on Mars, coincidentally, the same region chosen as the landing spot for NASA’s famous Curiosity Rover. Recently a great number of individuals have spoken out about Mars and how the red planet may have harbored an advanced alien civilization thousands if not millions of years ago. Dr. John Brandenburg, who has a Ph.D. in Theoretical Plasma Physics from the University of California and is currently working as a plasma physicist at Orbital Technologies in Madison Wisconsin believes advanced alien civilizations existed on Mars in the past, and were wiped out by nuclear attacks in the past. According to Dr. John Brandenburg, there is enough evidence to prove that at least two major nuclear blasts went off on the surface of the red planet in the distant past. The theory proposed by Dr. Brandenburg is based on the traces of uranium and thorium that have been registered on the surface of Mars. This Martian civilization was wiped out by another hostile alien race from elsewhere in the universe. Dr. Brandenburg warns that our civilization could face the same faith. Check out the RAW image of the structures here. Next Post:Was bitcoin created by a rogue artificial intelligence to take over the world?